To ensure damage-free of your possessions, Bob Lynch Moving and Storage goes the extra mile to properly pack and unpack your items, whether it be full or partial packing for your relocation. If you need assistance with your packing, we will be happy to quote a price for this service. Please contact us if you have any questions or would like to have a sales representative provide an in-home estimate. 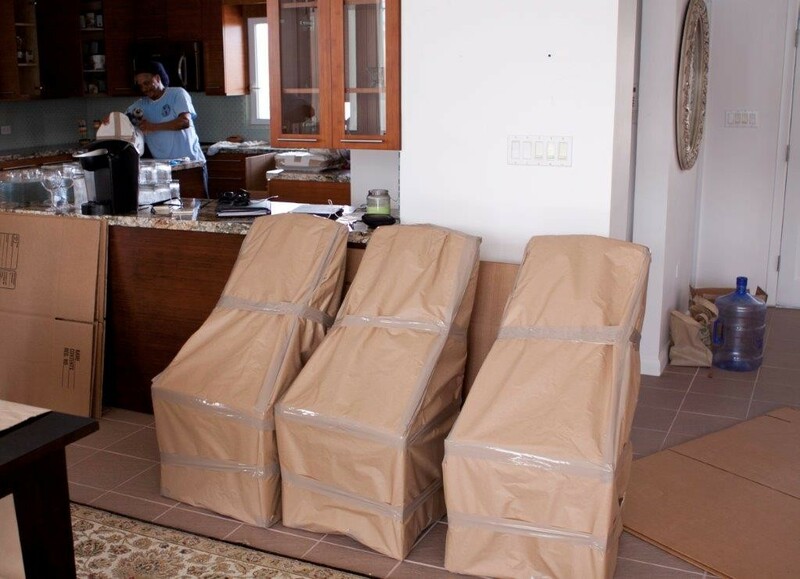 Our highly-trained drivers, packers and movers will carefully wrap, pack and crate all of your breakable items. We carry all of the proper equipment and materials to do the job efficiently and thoroughly. Our crews will remove hanging clothes from closets and place them into wardrobe boxes for transport. Upon delivery, the crew will hang your clothes in your new closets and remove wardrobe boxes. If the furniture is in good condition, leave clothing in dresser drawers. Remove breakables and small, loose items from all drawers. Empty antique and pressboard furniture of all contents, as the additional weight may cause unnecessary stress on the furniture. Most manufacturers of this type of furniture suggest these items should not be moved once they are assembled. These are made to be assembled just once and are not made to withstand the rigors of transportation. Remove all bed linens and mattress pads. As part of our moving service, Bob Lynch Moving and Storage will disassemble and reassemble your beds. Empty all drawers of all filing cabinets prior to your move. Box all your cleaning supplies together and take with you. For safety reasons, we cannot transport cleaning solvents and chemicals with your household goods. Many awkward or large pieces of furniture (armoires, large wall units, platform beds, dining room tables, cribs, etc) should be disassembled before moving. If you disassemble any furniture, tape the hardware to the unfinished side of the furniture or keep it in a safe place. Remove shades, bulbs and globes from lamps and pack them in boxes. We cannot ensure the safety of lamps or lampshades if they are not packed properly in boxes. Carefully disassemble and pack pole lamps as they are most susceptible to damage if not properly packed. All items of this nature must be properly packed prior to moving. If you are unable to box these items, please notify our office. Our crew will bring materials to pack or, if custom crating is required, a third-party service will be arranged. Additional charges may apply. Pack these items in their original boxes if they are available. We recommend that you pack and transport items such as jewelry, currency, prescription medications and important documents. We cannot be responsible for the condition of your plants. We will move them as carefully as possible, but sudden changes in temperature and environment may damage a plant. Refrigerators and freezers should be defrosted. Remove ice trays and other loose items. If the refrigerator is equipped with a water dispenser or automatic ice maker, please make certain the water to the refrigerator is shut off. Disconnect water and drain couplings. We can disconnect these for you, but we are prohibited from reconnecting these items. Gas dryers must be disconnected by a plumber. Front load washing machines require special servicing. Empty and clean grills. We cannot transport propane tanks. If firearms are to be moved, a complete list of make, model and serial numbers must be provided to our office before moving day. All gasoline-powered equipment, such as lawnmowers, must be drained. All surface grease and oil must be removed. If you choose to pack yourself, we hope you will find these packing materials list and tips helpful. You are going to need plenty of wrapping paper. Many clients save and use old newspapers. However, keep in mind the ink on newsprint never thoroughly dries. Consequently, the goods you wrap in newspapers are most likely going to be soiled and will require cleaning after unpacking. You will need many boxes in assorted sizes. All boxes should be in good condition and must be able to be closed and sealed. You may purchase cartons from us, but please note that paper products are expensive these days, and specially designed movers cartons are no exception. In an effort to save a few pennies, you might start collecting cartons from your local grocery and liquor stores. All too often grocery store cartons have the tops removed, but if you have a talk with the store manager it may be possible to have some for you with the covers still intact. Liquor cartons are excellent packing cartons. They are sturdy and contain dividers that are ideal for packing glasses, goblets, vases, etc. The best tape for this purpose is plastic tape. Rolls of tape should be at least 1.5 to 2 inches wide. This is for marking your packed boxes with such information as the contents of the box FRAGILE, THIS SIDE UP, or the location/room in which the box should be moved. Design your own system: blue for the living room, yellow for bedrooms, red for the kitchen and green for the home office. Whatever system you choose, color coding can be a simple way to quickly indicate location.